Service Portfolio versus Service Catalog: Are We Clear Yet? Everyone seems to agree the Service Catalog and the Service Portfolio are important, perhaps the foundation of IT Service Management. But there is still much discussion about what they even are. At first, the "service catalog" was a list of applications and infrastructure services. Then, it became the basis for service request management, and started looking like an Internet shopping cart. ITIL v3 attempts to clarify the distinction between the Service Portfolio and the Service Catalog, but there is still confusion in the IT industry. Is the Catalog part of the Portfolio? How are they related? What do things like the HR System have to do with ordering a new laptop? Some services have a beginning and end; others always exist - they are never retired. How do services with no beginning or end have a Service Lifecycle? Do we want services with no lifecycle in the portfolio? Do we need to force fundamentally different things into a common list? This panel will present various approaches to thinking about and structuring these foundational IT concepts, based on the panelists' experience and research. 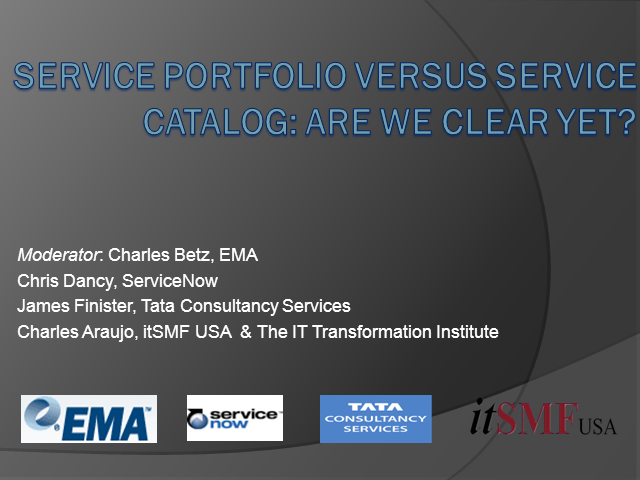 Title: Service Portfolio versus Service Catalog: Are We Clear Yet?